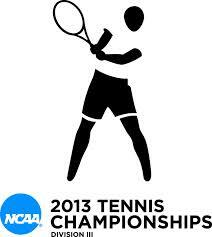 Kalamazoo, Mich. – The Gustavus men’s tennis doubles team of Amrik Donkena (Sr., Rochester, Minn.) and Mya Smith-Dennis (Jr., Savage, Minn.) concluded its 2013 campaign on Friday afternoon in the quarterfinals of the NCAA Men’s Tennis Doubles Championship. The pair fell at the hands of Nicholas Ballou and Raymond Worley of California Lutheran University by the scores of 6-2, 7-5. After a convincing 6-2, 6-3 win over Johns Hopkins yesterday in the first round, Donkena and Smith-Dennis found themselves on the other end of a 6-2 first set, falling behind by a set early in the match. The pair battled back in the second set, but could not pull it out, losing 7-5 to conclude the match. With the loss, Donkena and Smith-Dennis finish the season 21-9 as a pair. After playing together for the first time last season, the duo recorded a career record of 52-14 in two seasons together, including a run to the NCAA Doubles Championship match last season, which they lost to finish second.